Richard Maslowski finally has his car back. One car thief, seven parking tickets, one police chase, and a threatening letter from the city later, the 1993 Honda Del Sol is back where it belongs. Maslowski’s car was stolen March 22nd, and police couldn’t find it. But other city employees, parking enforcement aides, kept finding it repeatedly. The parking aides wrote five parking tickets on the car at the same address near Logan Square. Five tickets. And Maslowski kept getting the notices. After getting the notices, Maslowski says he called to find out if police had finally located his missing car. To add insult to injury, each of the notices carried photos of his car. In a different place than where it should be. He could see it. But he couldn’t get it back. “Looks as good as it did when it was parked in my parking space,” he said. Maslowski’s daughter Kristin Stockwell thought the whole matter was so absurd she checked out the address where the car had been spotted, to no avail, then visited the 14th district police station, to ask why police couldn’t find the car if the parking aides knew where it kept showing up. And Stockwell wanted to know why those parking aides couldn’t be told to be on the lookout for her father’s car, since they had apparently already found it five times. Andt it didn’t stop there. On Wednesday, Maslowski received a threatening letter from the city, informing him his car had been involved in an abortive chase with police April 19th, three weeks after it was stolen. The letter stated he was on the hook for a $2000 fine, and that the car was subject to impoundment. NBC5 Investigates ran Maslowski’s plate on Thursday, and discovered two new tickets, written May 31st, at a different address on West Belden street. And when a reporter visited? There was the car, where it reportedly has been sitting, dumped by the car thieves, two weeks ago. The steering column had been peeled by the thieves. The radio, and for some reason, the gearshift knob, were missing. 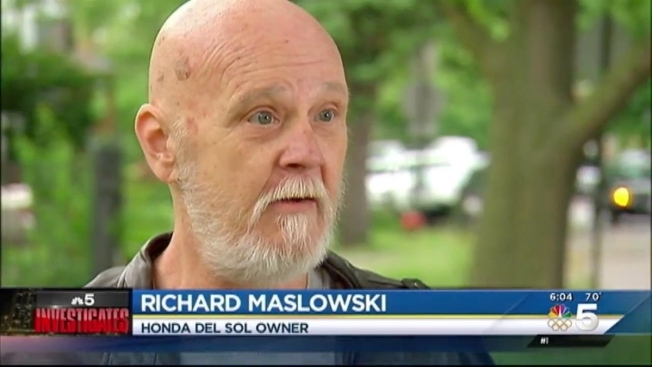 But otherwise, Mr. Maslowski’s Honda Del Sol was intact. Standing next to his car. Maslowski seemed amazed that he was finally getting it back. For three days, the Emanuel administration failed to answer questions about why parking enforcement aides don’t have access to stolen car information. Late Thursday, a joint statement was issued by Chicago Police and the Department of Finance. "Superintendent Eddie Johnson personally called Mr. Maslowski to apologize for this issue and to assure him that the tickets will be dismissed by the City," the statement said. "To help prevent these situations from happening in the future, the Department of Finance has been working over the last years to replace the technology in the handheld devices used to write tickets, and plans to upgrade the technology in those devices by the end of 2017. In the meantime, Finance and CPD will work on a solution to share data on reported stolen vehicles."